Do you know XMEGA, the new family of AVR microcontrollers? They look really sweet, especially for someone who already mastered the AVR architecture. More speed (32MHz! ), more peripherals (5 USARTs! 16 PWM channels! ), modular design, and you can still use the same well known tools. And then you read about the programming interface and... what?! What happened to ISP? No way I would purchase a completely new programmer model just to play with their new MCU! Fortunately, implementing the new programming protocol in USBASP was not that hard. Initially I thought it would be almost impossible, because PDI requires a constantly clocking signal and disconnects if the clock rate drops below 10 kHz. Strict timing is a problem for V-USB (USB protocol implementation used in USBASP) as it handles all USB transmissions in software and cannot do both things at the same time (like a guy who lacks brain power to walk and talk at the same time). The tests showed that the interrupt handling a basic control transfer only steals 40-50 us, and this is short enough to allow for the reliable PDI bit banging. Sending more payload (more than a regular control message) would break the clocking but the programmer can be scheduled to work in batches, so it gathers all data from the usb and only then begins the PDI transmission (hoping that there will be no new USB transmission for a while). 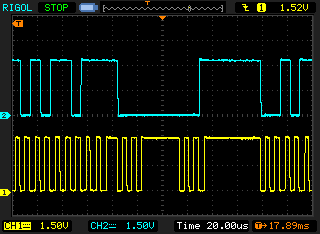 If you have a regular USBASP then it is 5V, while the PDI operates at 3,3V. 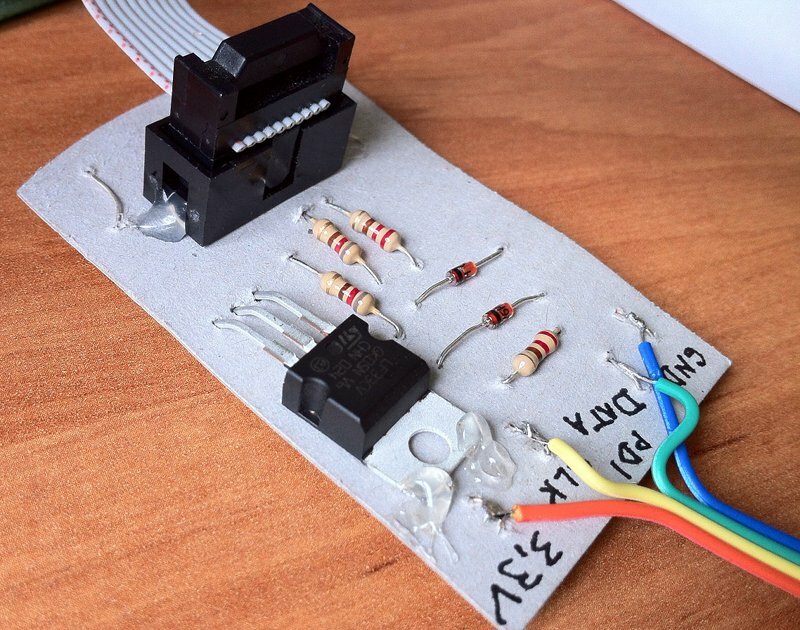 The simple way to reduce the voltage is just adding zener diodes and some resistors. As you can see, SCK becomes PDI DATA and MOSI becomes PDI CLK. R1 and R2 seem redundant but I put them here after the official Atmel PDI documentation. The thing is, the DATA line is bidirectional and the physical layer should be able to detect collisions. My implementation does not do it, but it could, thanks to the MISO line (maybe someone will implement it some day...). Another weird thing is RESET connection, it looks like it should be GND instead, and yes, this is GND, that can be disconnected at will. Permenent GND connection breaks the PDI bus-keeper so it must be disabled before receiving anything from PDI. If you want to power your circuit from a 5V USBASP then of course you need a 3,3V regulator - but this is not a part of the project. 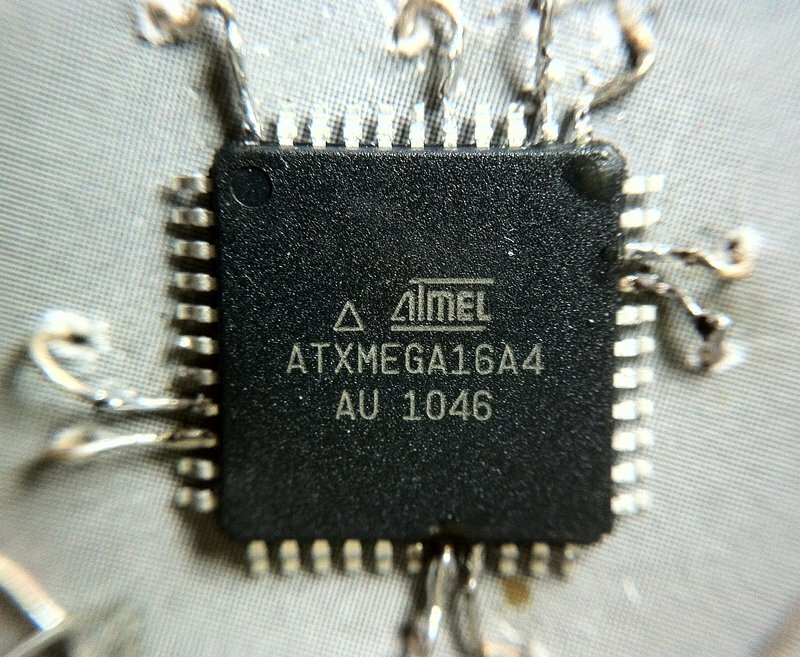 Note: ATmega48 is not supported because its flash area is to small for the increased program size. I only tested it on ATmega8 because that's what in my USBASP. ATmega88 should work, too. avrdude: reading input file "../../../xmega/xmegatest.hex"
It works for my ATxmega16A4 + Linux but it would be nice to know if it also works on anyone else hardware (especially that the PDI connection reliability depends on the V-USB interrupts). So... download it, test it (and maybe fix it), and if everything goes well, it could be probably included in the official USBASP and AVRDUDE releases. well it seems I am the first one to comment. Thanks for you wonderful work. I was looking for something like this for past few days. I will try this method and let you know the results. if there is no problem please publish your tests results about this here! thank you so much! and I want to appreciate you for your great job! very interesting post! i read this page,your work is very great! but i don't understand your patches! please put new .HEX file and avrdude after manipulate to me and more people can test this way. Got it working for an ATXMEGA64D3. replacing the part definitions in the avrdude.conf. Couldn't substitute the whole thing because the programmer definitions are in an incompatible format. I have tried for ATXmega128A1U and ATXmega64A1U and I use avrdude rev 1104 and update for avrdude.conf. I hope someone can solve this problem for ATXmega128A1U and ATXmega64A1U. first thing that comes to my mind would be checking if the parameters inside avrdude.conf file match the atmel datasheet for those chips, especially the "page_size" value. where did you get the xmega128/64a1u update? rev 1104 avrdude.conf does not have them. but the signature still use from parent can't use from datasheet. why ? I hope your comment! Finally thank for your work and I hope to be official at usbasp and avrdude. as for the signature, i think the avrdude somehow reads the correct signature from your conf file, otherwise it would stop with error message, telling that the signature does not match the chip. so, everything seems okay. read operation not supported for memory "signature"
Any thoughts what could be the problem? you mean, you used atmega16 instead of atmega8 in usbasp? at first i thought it can't work, because unlike atmega8, the atmega16's MOSI does not have OC2 output (that is crucial for PDI_CLK function in this project). but actually, if you are building your own programmer and not just connecting to an existing USBASP then you could have adjusted for this and used atmega16's PD7/OC2 for PDI_CLK instead of MOSI. the avrdude behavior is also consistent with the missing PDI_CLK timer hypothesis... it connects at first but then, after a second usb transaction, the pdi connection is gone. so, what atmega pin do you use for PDI_CLK? I used mosi for the clock pin. When I connect it to PD7/OC2, then the programmer says initialization faild even before it gets to signature. It seems that you setup the timer2, but don´t use it anywhere. Which mode should I use for the OC2 pin? Toggle OC2 on compare match? well, of course you would have to change the relevant PORT and DDR assignments when using PD7 instead of PB3 (functions: pdiInit, pdiCleanup, pdiSetClk1/0). the timer is certainly being used, otherwise the whole thing would not work ;-) see pdiEnableTimerClock and pdiDisableTimerClock. from what i see in the source, it works with no prescaling, CTC mode (OCR2=32), toggle OC2 on compare match. It was interested in created USBasp (PDI function). It is a very wonderful result. Operation by ATmega88 is also checked. Development progress is written to the following URL. Although it all is Japan, please use translation software and check it. btw. did you know the forum is rejecting access for anyone outside of japan? i had to use japanese web proxy to read it, otherwise i can only see "http error 403 - forbidden". I'm also using an Atmega88, but the clock seems to be very erratic. I'm guessing I didn't change the registers correctly. Do you think you could share the changes you made to usbasp? forbade access from other than Japan now. Although I feel sorry very much, please access using a http proxy. USBasp (PDI support) is slow. What kind of method can be considered for this improvement? usbasp's atmega8 won't be able to match the performance of the "true" pdi programmer (which implements usb and pdi in hardware rather than software), but definitely, some improvements are possible. first you could increase the pdi clock speed (decrease the delay in pdiWaitBit function), then maybe force inlining of the most commonly called functions (pdiSetClk0/pdiSetClk1/pdiSetData...etc...), or change them into #define's. was carried out, about 20% of time crunch was completed. Since it is not the result of still wishing, I improve. avrdude: reading input file "../../proj.hex"
looks like it works for a while but then loses the connection before reading flash... i wonder what would happen if you tried just reading instead of writing? i tested it about 10 times and the result is almost same. i used circuit number one for 5volt MEGA8 USBASP . I encountered a similar problem, using a 64 bit Acer aspire laptop, instead of my 32 bit desktops or laptop. (they all work fine) I tried re-compiling avrdude in the 64 bit environment, same result. The write operation goes 2x as fast, then the read fails. so, the only difference is 32 bit vs. 64 bit - very interesting test case! (i'm sorry for calling it "interesting", when for you it is only "annoying"). assuming the avrdude and libusb work exactly the same (why they should not? ), the difference must be somewhere in the windows usb subsystem. maybe the usb polling rate is different in 64 bit windows? i know it can be adjusted somehow and some people like to increase it to optimize the usb mouse responsiveness. changing this parameter wont harm a "normal" usb device, but my usbasp's PDI extension will fail if a new usb activity begins before the previous PDI operation was finished. (this is because unlike ISP, the PDI wont automatically pause/resume when the host stops sending a clock signal, and usbasp handles all usb activity in software so it has to interrupt everything else when something happens on the usb bus). so maybe if you tried tweaking the usb polling rate...? this is all assuming your 64 bit windows can handle the normal usbasp ISP programming correctly so we know the problem is PDI-specific. No, not annoyed. I thank you so much for sharing your work! I forgot to mention: Op Sys is Puppy Linux V. Lupu, not windows. Either way, "PDI extension will fail if a new usb activity begins before the previous PDI operation was finished." seems to me to fit what I see. Can the usb polling rate be adjusted in the source of Avrdude? Or is that a lower level thing? Re compile the hid kernel driver? But that only works for usage = HID_GD_MOUSE. What is the usage of a USBASP? aaaah, so that's linux! then perhaps i will be able to test this case by running some 64-bit live CD or something. my guess about the usb polling rate may be of course completely wrong, it is just the only thing i could find that could be different between systems. in linux, the default value is probably the same in both 32 and 64 bit. This block focus on new xmega with PDI interface. Great idea, I like to try this feature! Is there anyone can send me the HEX & revised avrdude.exe files? Today I tried to compile it on 32-bit Debian and 32-bit Mac OS X.
I already programmed the patched fw on the usbasp. If 88 works, 168 should also work. I started reading Jan Axelson's "USB Complete" It occurs to me that Vusb has to look at all traffic on the USBus for the correct address. I'm not sure about that, but it might be worth trying the USBAsp on a PC side controller with out anything else connected to it. Not not that a PC with no keyboard, not mouse, no camera, no wifi is very useful, but it might clear up what's going on here. avrdude.exe: reading input file "E:\My Projects\QuadRotors\Second QuadCopter\Programing\Main Board\Codevision AVR XMEGA\Xaircraft Softwares\(2) IMU+RC+MOTOR+PID\Exe\IMU+RC+MOTOR+PID.hex"
I still need your help!!! I've written and Verified EEPROM and it works but Flash does not work. i can't open your site forum. i have a proxy with 5 server but i can't do it. is it possible upload your file on the other server? how about is progress for merge to avrdude and usbasp official development? If usbasp is not to merge it, you can make your own firmware like usbasp2 but not for avrdude. I hope avrdude should be support officially. Thank you for your solution szu! I am exactly at the same point that you have described here so nice. But you have find the optimum opensource solution for the problem. There is a problem to compile the usbasp now. I mastered it and packed the whole modified source packages with precompiled binaries now, so everyone can use them or compile them easy again. Has anyone contacted the supplier of avrdude and usbasp? I will write them, because this solution should be implemented regulary. First, many thanks to Szu for his wonderful work. I have used the PDI mods to program x128d3 and 192a3u with no problems. However I could not program the flash memory on a x128a1. I could program eeprom Ok so I thought the chip must be OK and I Googled for many days without finding anything relevant. The I found in the 'Errata' section of the x128a1 manual that certain NVM commands do not work, namely ERASE_FLASH and WRITE_FLASH! Atmel say to use write and erase application section instead. There is an easy way to fix this but I am sure it could be done more elegantly, also these mods work with the 128a1 but have not been checked for other devices. Apply the patch file to avrdude and then find xmega_pdi.h in the avrdude source. Lines 41,42,43 contain the definitions of the NVM commands which DONT work on the x128a1, change 0x2B, 0x2E and 0x2F to 0x22, 0x24 and 0x25 on their respective lines. This gets avrdude to send the appsection commands instead of the generic flash commands so you will not be able to get at the whole of the flash memory if you have a very large application. In particular you probably won't be able to program a bootloader but for that purpose you could change the modified codes to 2A, 2C and 2D which should load a bootloader but not the rest of the application memory. I kept the modified version as avrdude128 and only use it to program the x128a1. This is not yet thoroughly tested but I will post again if I find any serious problems. I finally managed to make it work for me. It was little bit tricky because I used atmega16 @16MHz for USBASP. From beginning I wanted programmer for both tiny/mega (ISP) and xmega (PDI) so I combined both USBASP and your extension. Now I can confirm it works without removal of the PDI extension part on one PCB. Hardest part for me was avrdude build from sources. For Windows 7 64-bit. It took three days to successfully get avrdude.exe from MinGW. Problem was my gnu-gcc compilation skills. Especially because I have CLK/RESET/DATA pins on two different ports (B and D). Anyway I have one problem. After USBASP connection to USB and after xmega programming the CLK pin (RESET) is low. It means the xmega is kept in reset. I am going to update firmware to fix it but I do not fully understand your timer usage in pdi part. Your code uses HW clock generation (OC2) and also program logic that changes clock levels programatically. Please confirm these two approaches are not mixed. I see that HW clock generation is controlled in main.c but I do not fully understand program flow yet. One more comment: I see small typo in pdi.c. Search for (0<CS21). 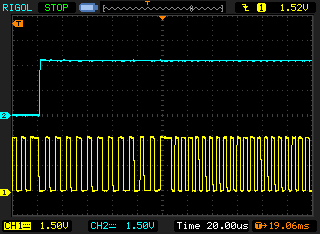 Also comment next to timer setup (12MHz/256) is little bit confusing because timer clock does not use prescaler. Ok, I solved both the issues. Original USBASP firmware sets port D as output with out level = low. In my case (atmega16) MOSI/CLK is connected to PD7. Call to ispDisconnect() in main solved reset after powerup. Reset after programming can be configured in avrdude by option -E.
Can anybody apply the path for PDI programming to newer avrdude (avrdude-6.0rc1 - from: http://download.savannah.gnu.org/releases/avrdude/)? I cannot get the connections of the circuit used. How can a clock pin, SCK of USBasp be connected to PDI_data? How can MOSI be providing clock? Because SCK & MOSI lines are software driven, when PDI is in use, the hardware SPI (in usbasp atmega) is disabled. Szu please provide us the hex file for mega8 !!! PLEASE!! I lost whole day figuring why I can't program xmega128a3u. And finaly solved problem when change computer! Desktop with linux doesn't work. Old laptop with winXp does the job. I do check logic waveforms and indeed PDI clock is disturbed to much in Desktop computer. There are gaps in clock longer than 200us! So probably is something wrong here. I gues that trafic on usb is different. Will the patched Avrdude be able to compile and work on Linux 64 bit too?